The new year is officially underway! With increased motivation, many have vowed to make lifestyle changes while others have put their focus on self-improvement. In an increased effort to use 2016 for the betterment of myself, I decided to create a vision board (cynics — keep reading!). 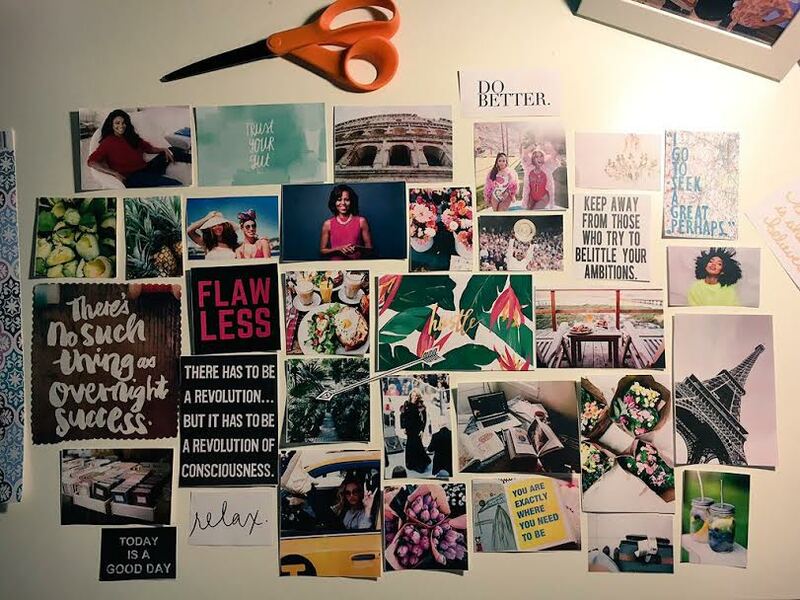 An important tool for creating a conscious life, vision boards have proven to lead to achievement and are perfect for jumpstarting a journey to victory. George Washington Carver said it best, "Where there is no vision, there is no hope." A lover of all things DIY, I chose to create a new vision board and reflect on my previously set goals. There is no sense in denying the power of visualization. One of the most powerful tools available, visualization confirms the cliche, "Seeing is believing." Many Olympic athletes credit their success to and have been using imagery as a form of mental training for years. According to Oprah, vision boards helped her become the billionaire that we know and love. Still don't believe pictures can greatly impact your life? The human mind responds to visual stimulation; therefore, the creation of a personal space can actually bring what's at the forefront of one's mind into reality. As I scoured through magazines and Pinterest pages for ideas, I envisioned my future self and how I would like to live and feel. Thinking about the sense of happiness obtained on past vacations, I opted for pictures of Rome, Paris and other memorable destinations. Adding quotes and other graphics, I compiled a group of pictures, each representing an aspect of joy or form of inspiration in my life. The one rule to creating an effective board is that there are NO rules! Creating my vision board provided me with a realistic approach to my dreams and clarification in what I find heartening. As I took a look at the graphics strewn across my room, I found myself asking, "What did I leave out?" The abundance of some images and the lack of what I initially expected to enjoy allowed me to find the source of my true inspiration. I came to the realization that I was creating this board not for a vision of society, but for myself. In the images that I selected, I essentially made a claim and sought a direction to pursue. I dedicated the new year to one of health, prosperity and joy, hence the prevalence of flowers, food, and an abundance of carefree black girls. As far as word choices, I chose empowering terms that evoke positivity. I found my images on various blogs and in magazines! Photo: Candice Crutchfield[/caption] The magic of your vision board is that nothing is set in stone. Pictures can be removed and replaced as your goals and adventures change throughout the year. As mentioned before, visualization is key. In order to remain inspired, I decided to put my vision board above my desk. While doing work and accomplishing other tasks, I'm provided the ability to glance at it and continue working toward my end goals. Although I'm no newcomer to the world of vision boards and boxes, this round proved to be the most enlightening experience yet! Do you have a vision board? If so, what's on it? Let us know in the comments below!